In Brief: A 10km hike that features mellow trails up to the Great Wall, some steep ups and downs on unrestored ‘wild’ Great Wall, and then a quick climb over a hill to complete the loop. Climbing up to the General's Tower on the Stone Valley Great Wall. Regular hikers: There’s a significant amount of crossover with this hike and our Middle Route of the Switchback Great Wall hike. We start off easy with a wee walk up the concrete road behind Stone Valley Village, a tidy settlement just on the Beijing side of the border. Further up the road we turn off on to a paved path up, and then take a turn for the hills on a dirt trail that leads up to the Great Wall. The trail takes us up through a forested valley, getting slightly steeper as we near the Great Wall. 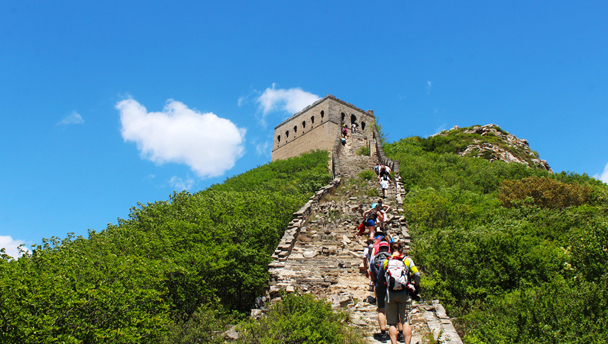 After taking a break by the Great Wall, we follow it up along a rough and unrestored section all the way up to a 1034m beacon tower known as the General’s Tower, the largest on this line of wall. From up on top of the tower we’ll have great views of the surrounding mountains, with more wall seen snaking off into the distance. We continue along the Great Wall, aiming for a pass where it dips down low. There are some steep and slippery sections on this stretch, with hill trail detours around the worst parts. Some exposure to heights, with a tricky descent. As we near the pass, the wall becomes too steep for fun hiking and we’ll follow a side trail down the outside, and then hook around through the pass. Once upon a time the pass would have been heavily fortified, but now the thick walls are tumbled down and we can stroll right through. We’ll follow a field trail further up the valley, and then hike a trail up and over the hill, crossing a rough line of what’s said to be Northern Qi-era (550–577) Great Wall before hiking down to Stone Valley Village to complete the loop. There’s a significant amount of crossover with this hike and our Middle Route of the Switchback Great Wall hike.